Bathroom facilities at Hemsford yurt camp, devon - DEVON YURTS Glamping in Style! Our yurt camp is off grid and runs solely on solar power so it is always a challenge to provide the nicest facilities for our guests. Our market research has told us that guests prefer a proper toilet as opposed to a compost loo and a hot shower as opposed to a cold one!!! With this in mind we installed a septic tank in the field adjacent to the yurt camp which allows for flushing toilets with no need for composting loos. The revolutionary gas powered shower works brilliantly without the need for electricity. There is one toilet with wash hand basin and hot gas powered shower and another separate toilet with wash hand basin. 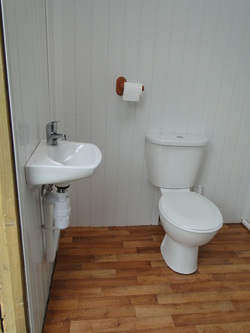 Our bathroom facilities have been made in a converted stable adjacent to the parking area and yurt field.